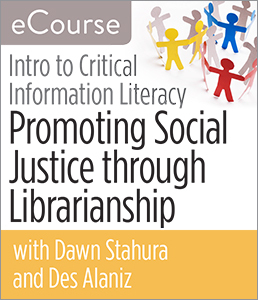 Chicago—ALA Publishing eLearning Solutions announces a new iteration of our popular eCourse, Introduction to Critical Information Literacy: Promoting Social Justice through Librarianship. Dawn Stahura and Des Alaniz will serve as the instructors for a 5-week facilitated eCourse starting on Monday, November 5, 2018. Librarians have a long history of fighting for social justice, and today the need to continue the fight seems as strong as ever. You may find that members of your community are eager to get involved as well, but how can you help them? How can you provide them with resources that you know are unbiased, reliable, and accurate? In this eCourse, information literacy experts Dawn Stahura and Des Alaniz will show you how. Together, you’ll look at instruction sessions through the lens of critical information literacy, discussing the inherent biases and systemic oppression in how information is disseminated and processed. This eCourse will provide you with useful strategies to incorporate the process of knowledge creation into your instruction sessions, while highlighting the racial disparities found in publishing. Throughout the eCourse, you, along with your instructors and fellow participants, will discuss the creation of critical annotated bibliographies and ho your students can take evaluation a step further and learn more effective ways to evaluate sources. You will look at alternative texts and resources to not only humanize the research process but address the lack of marginalized voices in the scholarly pursuit for information. Each week will consist of a discussion board question, readings, and an assignment that allow students to practice incorporating each week’s theme into an instruction session. Week 2: Inherent biases in subject headings, Library of Congress subject headings, and controlled vocabulary. Week 3: Process of knowledge creation and critical annotated bibliographies. Week 4: Evaluation of sources, fake news sites, and critical cultural producers. Week 5: Zines and other alternative media. Dawn Stahura is a Research and Instruction Librarian for the Social Sciences and the Zine Librarian at Simmons College. Stahura is an adjunct faculty teaching Reference and Information Sources for Simmons College. Along with her normal duties on the reference desk, she teaches instructional sessions, does one-on-one research consultations with students and faculty, and works closely with several faculty members to include zines in their course curricula as primary sources. Her instruction sessions are focused on critical information literacy, drawing awareness to the inherent biases found in library systems as well as critically evaluating sources. She also works closely with the Coordinator of Violence Prevention Outreach at Simmons on a variety of events focused on activism, social justice, consent, and craftivism. Des Alaniz is a queer, nonbinary chicane/librarian/archivist/zinester who lives in Boston with their handsome kitty Ze. Des is interested in community and nontraditional archives, outreach, and instruction. Registration for this ALA Publishing eLearning Solutions facilitated eCourse, which begins on November 5, 2018, can be purchased at the ALA Store. Participants in this course will need regular access to a computer with an internet connection for online message board participation, viewing online video, listening to streaming audio (MP3 files), and downloading and viewing PDF and PowerPoint files.